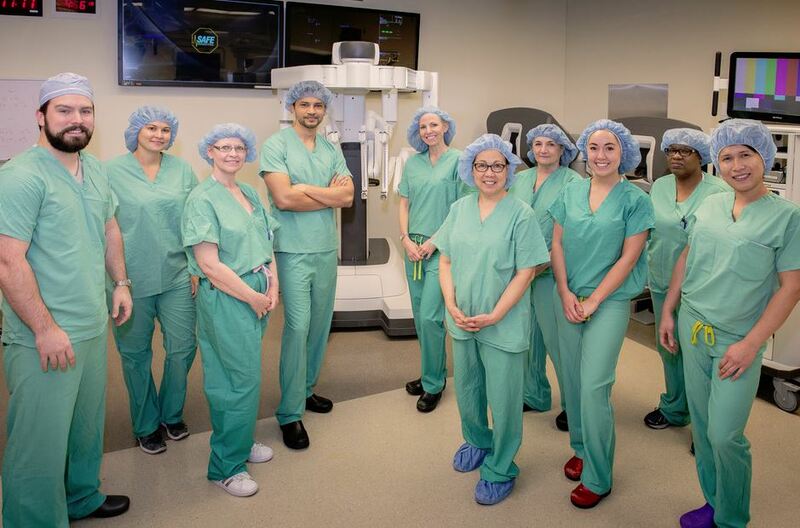 Northwestern Memorial Hospital is the first in the country to successfully complete robotic-assisted lung volume reduction surgery (LVRS) using the da Vinci Xi Surgical System® to remove diseased, emphysematous tissue within the lungs for the treatment of severe emphysema, a progressive form of chronic obstructive pulmonary disease (COPD). The robotic procedure allows the surgeon to precisely remove the diseased portions of the lungs, which may reduce pain and scarring, lower the risk of infection and shorten recovery time compared to traditional robotic lung volume reduction surgery. During the robotic LVRS, a surgeon with specialized training in robotic surgery sits at the computer console and looks through the stereoscopic, High Definition (HD) monitor to see inside the patient, giving the surgeon a better, more detailed 3D view of the operating area than the human eye can offer. The tower, which is positioned directly over the patient during surgery, contains the robot’s four arms—three that can hold a multitude of different surgical instruments, and a fourth that holds the system’s 3D cameras. These arms are controlled by a computer that exactly replicates the movements of the operating surgeon. Using the master controls, the surgeon maneuvers the arms of the robotic device to make three small incisions on the right side of the chest accessing the lungs and removing the diseased cysts called blebs. This lets the remaining lung tissue function better for optimal breathing. By removing the non-function lung tissue, the diaphragm, chest wall, and rib cage are able to return to a more normal shape and work more efficiently. Unlike the traditional surgical approach that uses a larger chest incision to access the lungs, the robotic LVRS only requires three 8-millimeter incisions. The smaller incisions reduce scarring and minimize the risk for infection, while also potentially reducing the length of stay in the hospital. Emphysema is classified as a form of COPD caused by damage to the alveoli, the tiny air sacs in the lung where the exchange of oxygen and carbon dioxide occurs. With emphysema, damage to the alveoli results in air becoming trapped, causing them to expand and rupture. As a result of the progressive damage to alveoli, people with emphysema experience a decreased level of oxygen in the blood combined with an increased level of carbon dioxide in the blood. Currently 16 million Americans are affected by COPD according to the U.S. Centers for Disease Control and Prevention.